Experts have warned against a knee-jerk reaction after the parents of a murdered teenager blamed his killer's obsession with a violent video game. The parents of Stefan Pakeerah, 14, who was stabbed in Leicester, have called for the game Manhunt to be banned. Giselle Pakeerah said her son's confessed killer, Warren Leblanc, 17, had mimicked behaviour in Manhunt. Industry bodies have said it is wrong to blame the game - which has an 18 certificate - but retailer Dixons has already taken it off the shelves. It is not the first time "shoot-em-up" video games have been blamed for triggering a violent response. Relatives of Columbine High School victims filed a lawsuit against game makers after it was claimed teenage killers Eric Harris and Dylan Klebold were influenced by games including Doom. And German teenager Robert Steinhaeuser, who shot dead 13 teachers and two fellow pupils before turning the gun on himself, was reportedly an avid fan of the game Counter-Strike. 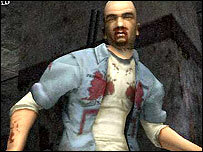 Manhunt, developed by Edinburgh-based Rockstar North, is unusual in that players get higher points for inflicting a more grisly death. It was banned six months ago in New Zealand because of concerns over its high level of violence. Stefan died after Leblanc beat him with a claw hammer and stabbed him repeatedly with a knife. But Mark Eyles, senior lecturer in computer games at Portsmouth University, said it was wrong to leap to the conclusion the game was to blame. Do we want to ban everything that is violent because it may be that children would get hold of it? "It's an easy target," he told BBC News Online, saying it came down to parents to ensure their children played suitable games. "If you have an extremely violent game that has been designed specifically for adults then that's who should be playing it - it's not appropriate for children," he said. "It raises questions about what sort of society we want. Do we want to ban everything that is violent because it may be that children would get hold of it? "Or do you want a society where people are responsible for themselves and for their children?" He said there was no definitive research linking bloodthirsty games such as Manhunt with violent responses in players. "I don't think it's going to drive anyone out to go and start murdering people - not unless they are already thinking along those lines," he said. But US-based lawyer Jack Thompson, a leading campaigner against the sale of violent games, is set to take up the fight having been contacted by Mrs Pakeerah. 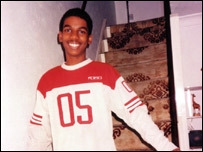 He is convinced of the direct link between increasing numbers of killings by teenagers and games like Manhunt. Mr Thompson told BBC News Online: "It encourages you to enter into the notion that acting in this way is appropriate. "This is the problem with interactive violence - you enter into it as a participant much more than in a movie theatre." He said neurological studies showed teenagers' brains processed stimuli from games differently to those of adults. "These types of games are basically murder simulators. There are people being killed over here almost on a daily basis." But a British Board of Film Classification (BBFC) spokeswoman said banning violent games was "using a very large sledgehammer to crack a very small nut". A statement said: "For a game to be banned the BBFC would have to have very clear evidence that it was a cause of potential harm. "There is no evidence playing video games results in violent behaviour. There is evidence that violent people are attracted to violent material. 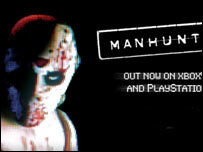 "Manhunt is available throughout Europe without any restrictions. The UK has one of the most restrictive regulatory regimes." Manhunt's maker Rockstar North expressed its "deepest sympathies to those affected by these tragic events". A statement said: "Rockstar Games is a leading publisher of interactive entertainment geared towards mature audiences and markets its games responsibly, targeting advertising and marketing only to adult consumers aged 18 and older." The firm said all its games were passed to the BBFC for classification. The Entertainment and Leisure Software Publishers' Association, the video game industry body, said: "We sympathise enormously with the family and parents of Stefan Pakeerah. "However, we reject any suggestion or association between the tragic events and the sale of the video game Manhunt."